After 12 of us had eaten our fill, there was still a LOT. They had lots and lots of containers and after supper we packaged it to freeze and use all winter. There was 15 lbs of beef, 6 chickens, 36 lbs of potatoes, 20 lbs of onions, 6 heads of cabbage, several #10 cans of tomatoes and corn. Have any of you had Burgoo before? Follow this link to learn more...ours was from a Meredosia recipe, down the road a piece from Arenzville! Interesting. I'd never heard of burgoo. Thanks for the link! I've never heard of it either, but i will give it a try, but in a much smaller pot. For some strange reason I can't open that file Wolfy, do you have another link ? Thanks, PW.....I think it needs to be, too! I've got an older DO cookbook that my in-laws gave me. Maybe I should go thru and post up a couple recipes from it soon... Not tonight though. Yep, just browsing through this section and saw some threads with a lot of good resources that should be easy to find. Thanks Wolfy and all who contribute here. Lots of good stuff. Posted this in the camp recipes too...but what the hey. 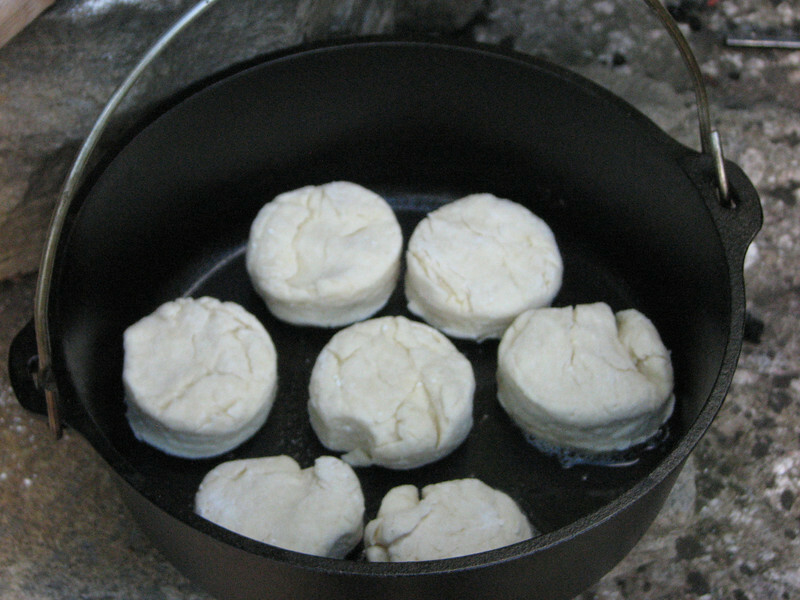 I've been over at this link for over an hour looking at Dutch Oven cooking ideas. This one in perticular really had me wishing I could eat eggs. I dont know why..but oh does it look good. I would think this recipe can be done in a GI mess kit too. And if you have lots of time on your hands.. go to her home page and enjoy browsing and drooling. I like that she puts assembly and finished pictures in her posts. That does look good WW! 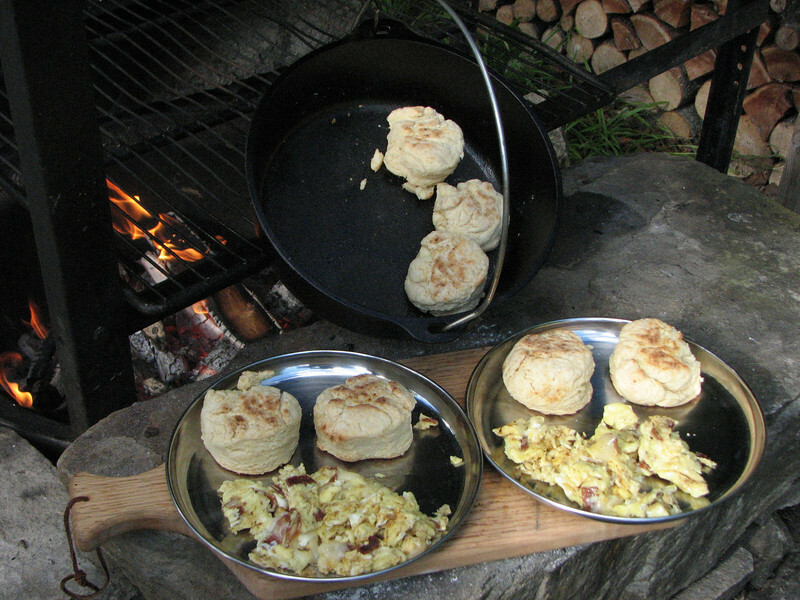 Its definately a breakfast for the outdoors.dontcha think? Eggs:.. I grew up on them. ate many many eggs. And then we (dad,brother, and I) got this horrible egg flu we called it. And since then I would try eating eggs...fried,poached ect.. but it will come up with out warning with in minutes. I dont even get a 'sick' feeling. And when I had an allergy test done with all those pricklings... eggs swelled up the worst. I was warned to never get a flu or any shot incubated in egg. And yet.. in baked goods I have no problem. Except homemade puddings. But I sure do wish I could eat them.. they've got to be the easiest fastest cheapest meals one could make. I miss that. Both the guys could resume eating eggs. Wow, there sure are a lot of recipies in there. Glad someone bumped this, or I'd have probably never seen it! It's a sticky thread so you can find it at the top of the Food and Cooking forum whenever you want to find a recipe. OK BH, Hears one you'll like a lot. 2- pounds of Chicken pieces. Coarse salt & fresh ground pepper. 2- cups of Leeks or green onions or yellow onions. 1/2- cup of apple cider vinegar. 1-1/4- cups of Chicken stock. 3- cups of cooked brown or white rice for serving. Season chicken with salt and pepper to taste and Brown in oil until golden brown. Set chicken aside and cook Leeks or onions until tender. Add all the ingredients to the pot, bring to a boil, then cover and place in oven. Serve with Rice on the side or over the rice, it's good either way. That's on the list the next time we butcher some chickens, which should be in a week or so! Now, if you're interested I have an old recipe for Cornish game hens or ruffled grouse, I think I posted it in the cooking section a while back, I don't know if I could even find it. But it involes slow roasting small birds, part of the ingredients are Granny smith apples, Frozen Apple consentrate, yellow rasins, an a little red wine to deglaze the pan. It's a pretty simple recipe, but does call for reducing and straining the pan drippings at the end, it makes a semi-thick fruity sauce that's poured over the birds before serving, and some is reserved for adding more at the table. The sauce is so good that you are tempted to drink it right out of your gravy boat , if you're interested, let me know. Sure I'd like to try it, but it'll have to be on a regular chicken though, all of ours are full grown now. I've never tried it with birds over a pound and a half or so, Cornish hens, ruffled grouse, and pheasant, how much do your birds average weight wise ? The Roos we just butchered are between 5 1/4 to 5 3/4 lbs dressed. The hens I suspect are going to be around 4 lbs or so dressed, some will most likely be a little less. That's what they normally are when we have butchered them in the past. 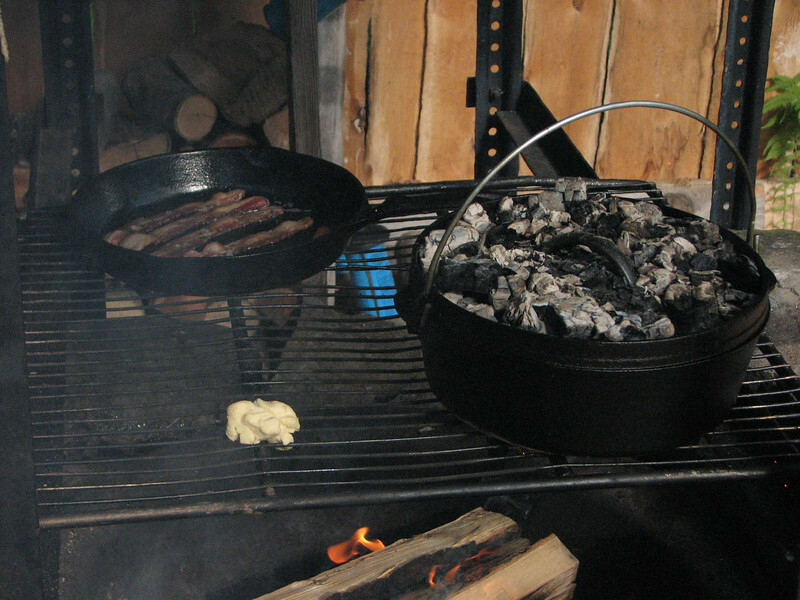 Another pretty decent batch of recipes from the Boy Scouts for general camp cooking and Dutch oven use! I bought the Boy Scouts Dutch Oven cookbook last summer. LOTS of yummies in that one. Thats a good site you have there , Wolfy. Do you know of that dump cake done with a yellow cake mix? We had a dessert today like that but it was rhubarb as the fruit. Lordy it was goooood... warm with vanilla ice cream on it. Drizzle batter over the top and bake until top is golden brown, about a half hour at 350. Last fall my friend Milz and his nephew Dylan baked a pineapple upside-down cake at our fall meet that was a great success. He made it the first night, and got so many cheers that he had to make another one for the video! Thanks Professor, that does sound good. By the Way, It's nice to see you spending a bit more time on the forum, we do miss your tips & tricks with food, and your company as well. Theres a facebook site that's growing in leaps and bounds in the last month (40,000 and counting) that's been fun to see all the cooking, collecting and cleaning going on. They share recipes under files. And recipes go in waves.... Dutch Babies were a huge hit. I can't view it because I'm not on Facebook.......and won't ever be. We just grabbed a copy of the Lodge Field Guide to Dutch Oven Cooking at our local wally world- think it was $9.00. We're going camping at a state park this coming weekend and hope to give the new 10" we got last fall (from the factory store) a try. I scrubbed and seasoned it and the trivet rack last night, but haven't decided what we're cooking yet...probably either stew or chili as it's supposed to be wet and cooler-blah! Dano, please take pictures of the 10" in action. I've been looking at one online and would like to see some size reference if you could show some. WW- sorry I just saw this tonight, and we didn't take any pics, sorry. Next time out I will, but I really like the size so far if you're thinking of getting one. 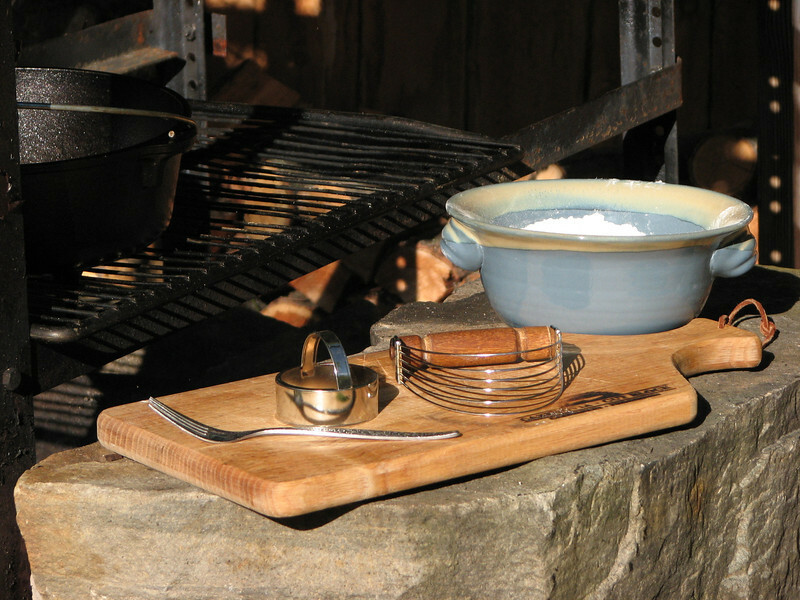 We did use it on our camp out and it fed 6 adults. We made beef stew with about a pound and a half of stew meat, then added a few potatoes, carrots, onions, a can of diced tomatoes, a stew flavor packet and then added a container of beef stock to just under the lid (it actually almost seeped over the top as it was simmering). I normally wouldn't have filled it that full, but knew we would all be hungry, so I added extra stock. There wasn't enough to save when we got done. The same thing in the 12" would have had a lot more headspace and not spilled out when I stirred it. Not sure if that helps any....wish I'd seen this before we went dangit! This is the best cornbread I think I've ever had, honestly!! It is very rich, very moist, very sweet and VERY filling. It has almost a cake-like quality to it, and could serve as a dessert almost. I did take a piece and heat it over the coals in foil and had it with maple syrup the next morning....yummy! This was made in a 12" dutch oven, per the recipe, but I think you could cut it in half and make it in a 10" just fine. It was probably close to 2 1/2" tall/thick, maybe more. In a large bowl, mix the eggs, milk and butter. 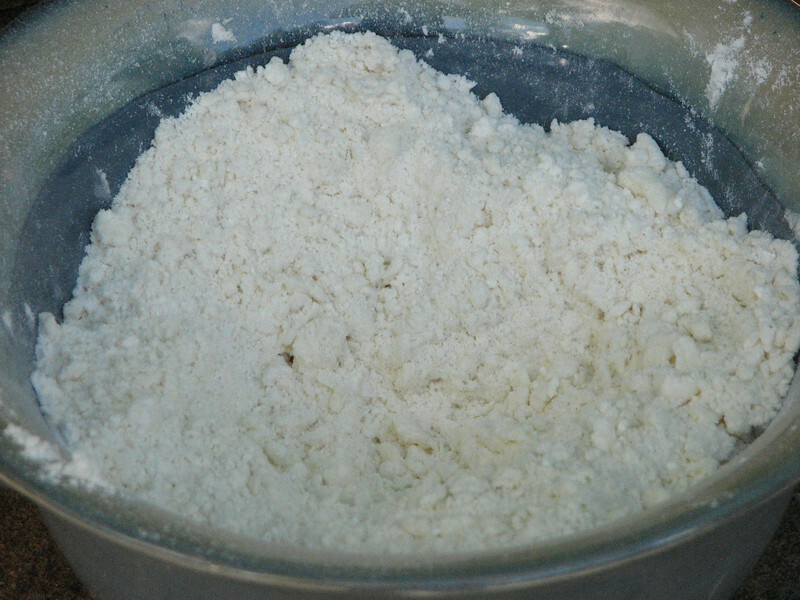 In a separate bowl combine and mix together well all the dry ingredients. Mix the dry ingredients with the liquid ingredients one cup at a time until well blended. Spoon the mixture into a cold 12" lightly greased dutch oven and spread evenly. 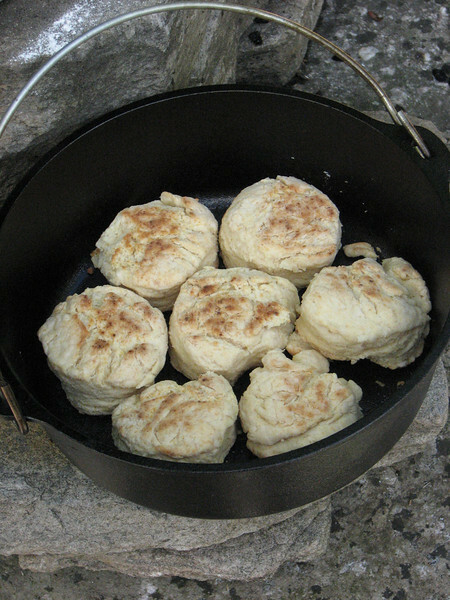 Cover the dutch oven and bake with 8-10 briquettes on the bottom and 14-16 briquettes on top, for 45 minutes or until cornbread turns golden brown and an inserted fork/knife comes out clean. (With all the liquid ingredients the cornbread will be almost done, but still have a bit of bubbling going on at about 40 minutes) Once it is browned and a knife/fork can be inserted and pulled out clean, it's done regardless of how much liquid remains- it will soak back into the bread as it sits for about 5 minutes. Be sure to rotate the lid and oven 1/4 turn in opposite directions every 10 minutes until done. Let sit with the lid on after removing from the coals for about 5 minutes before slicing. Eat until you pass out, it's really good!! Cut in shortening until pea sized. 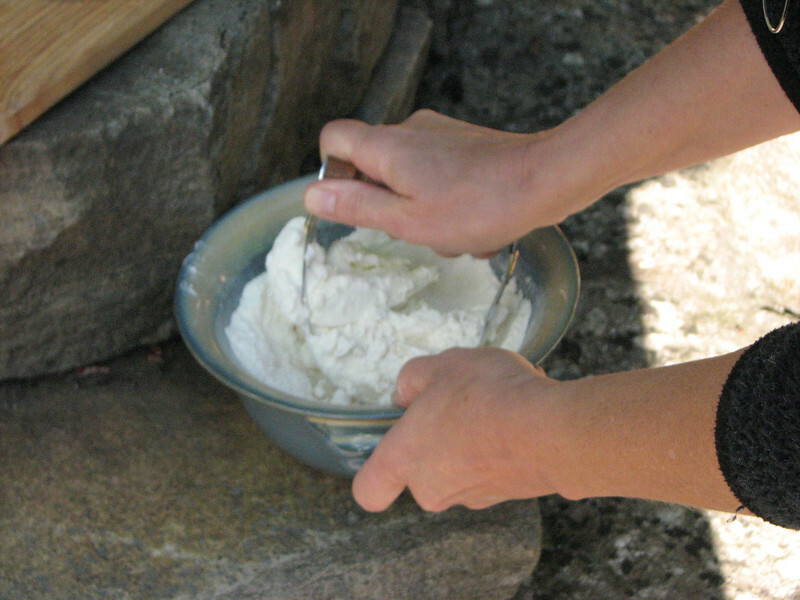 Stir in milk until all dry ingredients form a ball and pull away from sides of the bowl. Do not over blend. 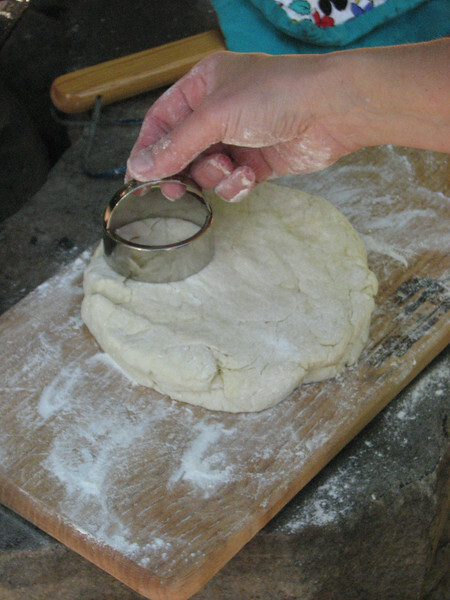 Put on a floured surface. Knead 8-10 times. Do not over knead. Flatten into circle approximately 1/2 to 3/4 inches thick. Using a cookie cutter cut 7-8 biscuits. 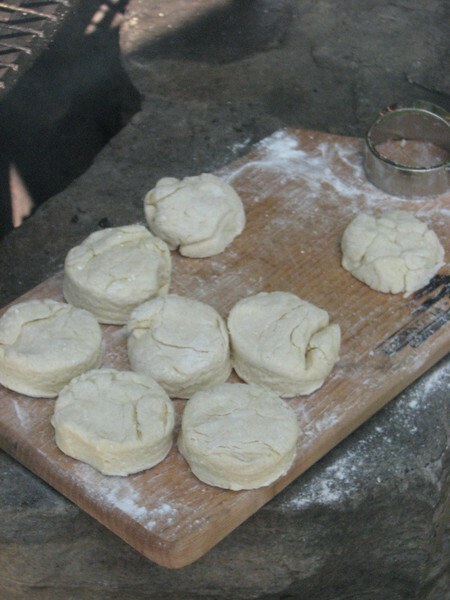 Put scraps together to form last biscuit. 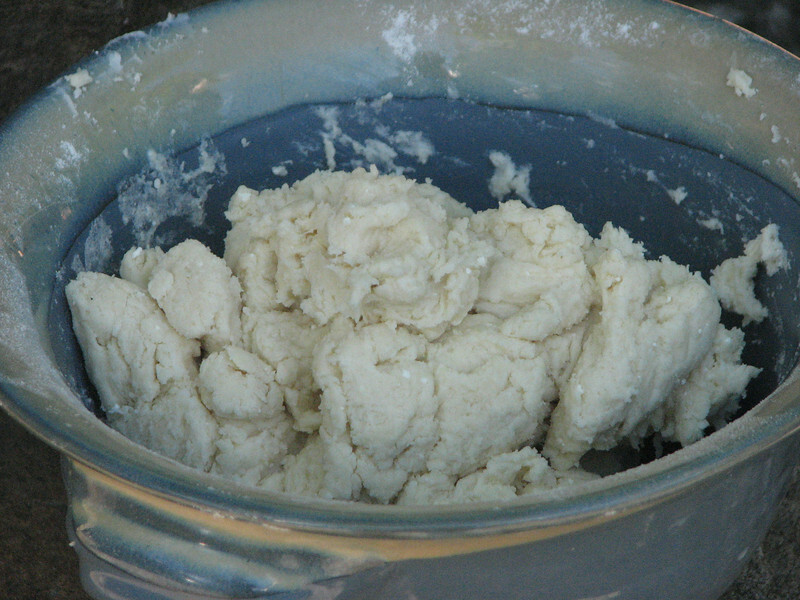 Again, do not over handle the dough. Bake in pre-warmed, oiled Dutch oven over medium heat (5 second rule). Time will depend on how hot your fire is. Probably 12-16 minutes. Check mid way to make sure the bottom isn?t burning but do not keep checking or it will impact the quality of the biscuits. 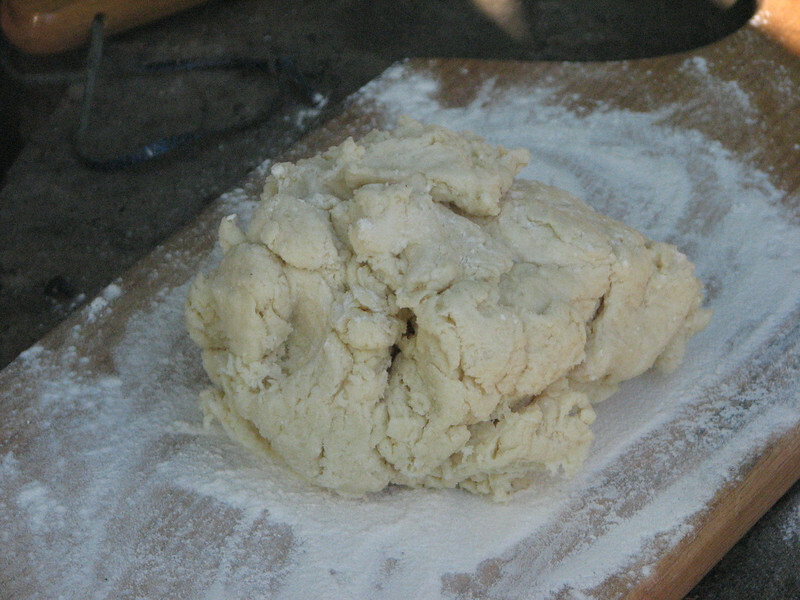 If bottom is baking more quickly than the top, the biscuits can be turned midway through the bake. Bacon, Eggs, and Cheese, with home made biscuits on a sunny Saturday morning. 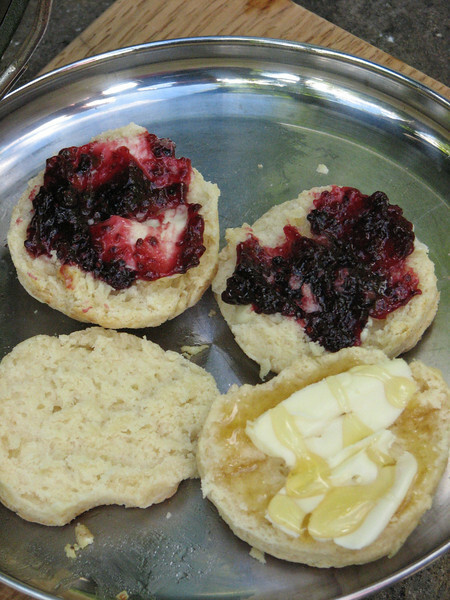 And for dessert, home made biscuits, with home made, home canned blackberry jelly. If baking for a sweet treat, increase the sugar to 2 T. They taste great with fruit and whipped cream. 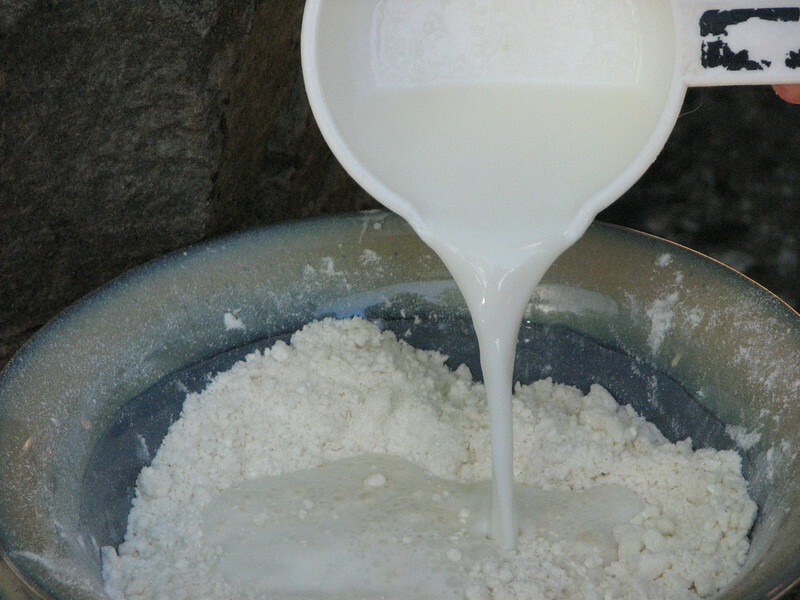 Also if you are doing them away from home you can substitute olive oil for the shortening and use water instead of milk (because there is already powdered milk in the mix). You can mix the whole thing in a gallon size plastic bag. This will change the consistency of the final product but they still taste good.